U.S. Secretary of State Rex Tillerson recently told CNN’s Jake Tapper that his diplomatic efforts would continue “until the first bomb drops.” This echoed sentiments shared by U.S. Sen. Lindsey Graham, who says the United States needs to threaten North Korea with a “credible military option” if the regime continues its nuclear weapons and ballistic missile program. The Senator from South Carolina has even said U.S. officials and military experts are “wrong” to think that no good military options exist. “There is a military option to destroy North Korea’s program and North Korea itself,” Graham said after one of the North’s missile-tests. The problem with these statements is that there is no good military option. Too often our foreign policy vision ends at the tip of our nose. Today’s debate needs to be about more than just “taking out a bad guy.” As we learned in Iraq and elsewhere, if we pursue policies without an essential and achievable political end-state, we back ourselves into costly and unproductive wars that don’t enhance America’s security. A strike on North Korea would unnecessarily jeopardize the lives of millions. It would also have consequences that could very easily spiral out of control. And the U.S. risks being seen as the aggressor, even by our regional allies, which would be catastrophic for America’s standing in the world and for our national security. All hope for a peaceful outcome is currently being placed on coercive pressure, with the newest round of sanctions being passed by the United Nations Security Council just this year. These sanctions, and any economic pressure on the Kim regime going forward, rely heavily on North Korea’s lifeline and neighbor to the north, China. 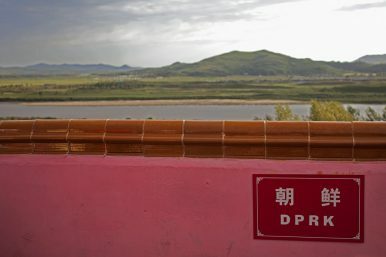 In truth, China has a bad marriage with the Kim regime — but it harbors far more resentment for the idea of Kim’s government being replaced by a U.S.-backed government, loaded with American firepower and just across the Yalu River to its south. Part of President Trump’s rhetoric is surely aimed at making China think the U.S. might be so unwise as to choose the military option. The rhetoric might even be causing some movement, as there has been a slight slump in trade between China and North Korea. But long-term Chinese compliance with the U.N. sanctions is yet to be seen. And the Trump administration is growing impatient. What else can be done to avoid a conflict that would kill millions, while working toward a unified and denuclearized Korean peninsula? The key is understanding the big picture, while taking the long-term view, so we can make a deal with China. Think from the North Korean perspective: Kim Jong-un sees a lineup of ousted dictators and doesn’t believe America will ever give up on “regime change.” He wants an insurance policy to guard against the same fate which befell Saddam Hussein and Muammar Gaddafi. Kim Jong-un wants to live, and going nuclear helps guarantee his own survival. China, on the other hand (and contrary to most commentary), would actually love to be rid of the Kim regime. On most days, China has quite cordial relations with the South (sometimes much better than the relations that the South has with Japan) and trade ties between China and South Korea are strong. But China will not accept U.S. troops on their border, just as we would do anything — absolutely anything — to keep Chinese troops from setting up shop in Mexico or Canada. America, and most of the world, including China, wants a denuclearized Korean Peninsula. As Michael Desch, Director of the Notre Dame International Security Center, has argued, the United States must be willing to make a better deal with the Chinese than bluffing on catastrophe and hoping China follows through on sanctions. At some point, the Kim regime will collapse, as all despotic regimes do. The Trump administration needs to prepare for this eventuality, and make a deal with Beijing to ensure a positive outcome. As part of the grand bargain, the prospect of a unified and democratic Korea without significant levels of U.S. troops should be on offer, in exchange for China securing the North’s nuclear stockpile and allowing the North to reunify with the free South. Policymakers shouldn’t stop there, however. Right now, America can offer China a reduced U.S. footprint in South Korea in exchange for increased Chinese economic pressure on the North — while still unlikely, that pressure might result in the North freezing its nuclear weapons program. This would require China handing the North a nuclear security guarantee. If the North complies, which is in China’s interest, the U.S. would follow through with troop drawdowns in the South. Would China be open to such a bargain? The U.S. should find out, working diplomatically, rather than coercively, to align China’s interests with America’s on this critical issue. Such a strategy would help prevent war, provide an opportunity for a sustainable outcome that is in America’s interest, and it would also fulfill multiple campaign promises made by the president. Here, Trump is both making a good deal and reducing America’s subsidizing of other wealthy nations’ defense budgets. Our military and diplomacy must always work in concert with each other. At no point should diplomacy stop. And our military should not be used unless absolutely necessary and as a last resort. Washington should not back us into a no-win situation where the only goal is to save face by escalating tensions with the North–and China –ever further. Instead, the U.S. needs to think strategically about our desired political end-state on the Korean peninsula. Doing so presents us with diplomatic avenues that are yet to be pursued.